summoner: Tool for scaffolding fully configured batteries-included production-level Haskell projects. Tool for scaffolding fully configured batteries-included production-level Haskell projects. See README.md for details. Summoner is a tool for scaffolding fully configured batteries-included production-level Haskell projects. Do you want to create a library that is to be uploaded to Hackage/Stackage, that builds with both Cabal and Stack and supports the latest three major GHC versions? Or you are building a production application which uses a custom prelude and has CI with Travis Linux and AppVeyors Windows checks? Summoner can help you do all that with minimal effort from you - it can even upload the project to GitHub if you wish! By the way, Summoner operates as either CLI or TUI application, so you can choose what you're more comfortable with and install only the required one. Directory smallProject contains an example of the straightforward package, and fullProject shows a generated project with more advanced structure and more features. Summoner is a tool that combines predefined configurations, command-line arguments and a chosen interface. To fully understand the power in your hands with the help of Summoner, please check out this section. Below you can see highlighted features in different categories. Support for Cabal and Stack build tools. Ability to pick stanzas (library, executable, test-suite, benchmark). Option to include an alternative prelude, if desired. The project would then use base-noprelude technique, and the Prelude module would be added to the library target. Support for multiple GHC versions, with thoughtful reflection on project meta, base versions (e.g. base >= 4.9 && < 4.12), etc. Ability to create runnable Haskell scripts. Different license support: MIT, BSD2, BSD3, GPL-2, GPL-3, LGPL-2.1, LGPL-3, AGPL-3, Apache-2.0, MPL-2.0, None (All Rights Reserved license without file). Creation of the CHANGELOG.md file with PVP versioning policy. Ability to include your .stylish-haskell.yaml file. Usage of the ghc-options field with sensible defaults. Initialisation of the git repository inside the project folder. Uploading the repository to GitHub. Formation of the README file with Hackage, Stackage and CI badges. Linking to the GitHub repository in the .cabal file. Ability to include your CONTRIBUTING.md file. Guessing user credentials from .gitconfig. Generation of the .travis.yml file that runs build and tests on CI under Linux using Dead simple Haskell Travis Settings for Cabal and Stack. Configuration matrix on CI to build with multiple GHC versions and various build tools. -Werror is enabled on CI not to miss any warnings. Run HLint checks on CI. Generation of the appveyor.yaml file which runs build and tests on CI under Windows. Ability to create a project in offline mode. 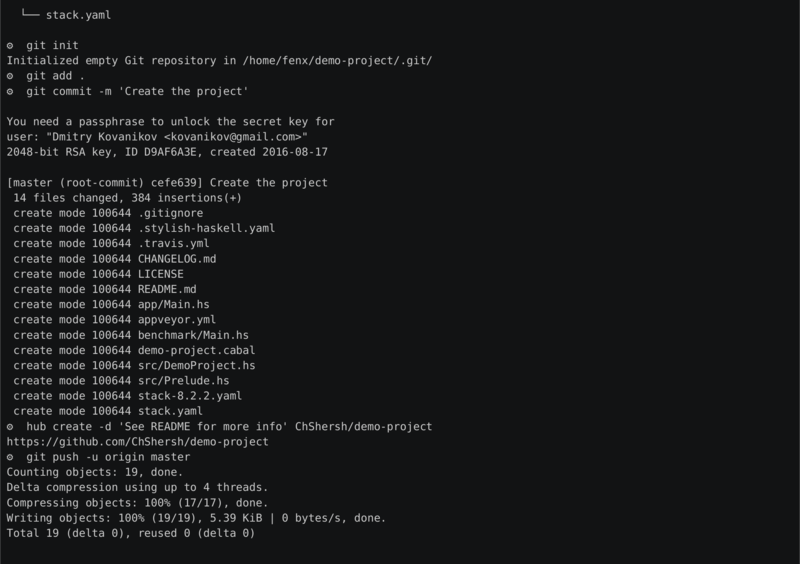 git – to initialize the GitHub repo. hub – to upload the project to GitHub. curl – to download licenses. 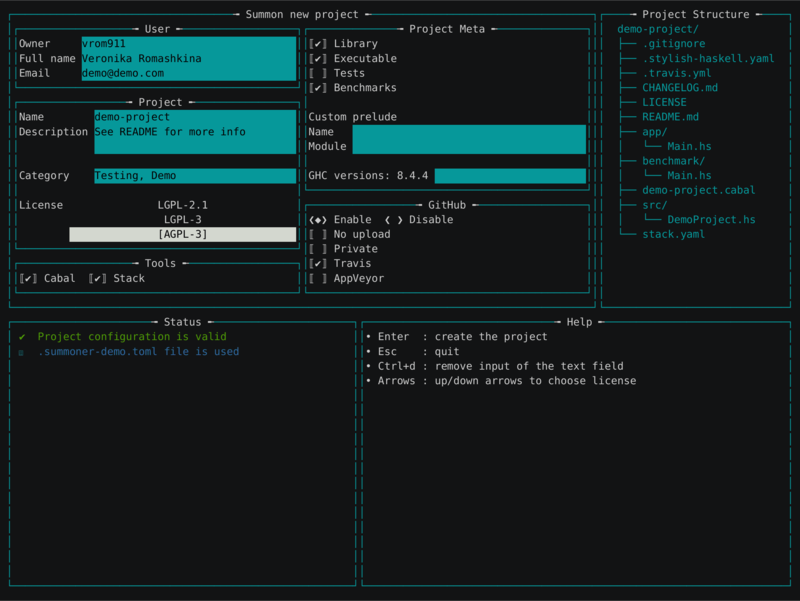 summon: scaffold projects using interactive CLI mode. summon-tui: scaffold projects using TUI. Below you can find the description of how to install each of them so you can choose the one you want. NOTE: summon-tui is not supported on Windows. See this issue. You can download binary directly from GitHub releases. Fields user.login, user.name and user.email from ~/.gitconfig. Explicitly specified configuration file by --file FILENAME option (used instead of the default one if specified). Options that are stated by CLI arguments. TUI – User data specified in the window of summon-tui. CLI – Interactively inputted answers during execution of the summon command (for the options that were not specified on previous steps). To cut a long story short, the configuration uses Partial Options Monoid Pattern. Here is the list of the options that can be configured to suit your needs. If options are not specified, they are asked interactively (or some sensible defaults are used). See the example of the configuration for projects of the Kowainik organization. --no-upload              Do not upload to GitHub. Special case of the '--offline' flag. and without uploading to GitHub. For example, the following command preconfigures the project settings with the custom prelude relude, included library, executable, test stanzas (but without benchmarks), creates a private repository on GitHub with the Travis CI and AppVeyor CI integrated. Section 1 – The main section where user inputs data or changes the configurations. Section 2 – The structure of the project that is going to be created with the current configurations. This tree changes on-the-fly. Section 3 – Hints, project status, or current errors in the configurations. Section 4 – Useful hotkeys. The TUI window opens with the pre-filled information received from a config file and command-line arguments. However, it's possible to change any field as per your needs. In the screenshot you can see that you'll be given a few text fields to fill in or some checkboxes that represent boolean values of the configurations. To help you fill in the correct input, there are some ⓘ info messages in the Status section, which give additional details about the current field. Note that the form should be valid in order to be able to go to the Confirm window. If there are some errors in the input, you could see details about these errors in the Status section of the form. See CLI description of the summon script command. These commands display the list of supported GHC versions or Licenses. Also, when the license name is specified the window with the scrollable content of the License text is shown. In CLI mode of operation Summoner asks about every project setting. Most of the questions contain a default value, so you can press <kbd>Enter</kbd> to choose the default value. If some option is specified via a configuration file or CLI arguments, then the question is skipped and the predefined value is used. This command creates minimal cabal or stack script file which allows you to save some keystrokes and eliminates the need to remember magic words for scripts. These commands display the list of supported GHC versions, or Licenses. Also, when the license name is specified, the content of the License is outputted to the terminal. I want to use HTTPS remote for the created GitHub project, but it creates SSH one. How should I fix this? We can not change or configure this behaviour, but there are several workarounds in case you need to use HTTPS link for the remote. Summoner is a multi-package project which has two packages inside: summoner-cli and summoner-tui. We are supporting the same functionality in both of them, so, if it's possible, you should add/change the code in both of the packages. Summoner uses the custom prelude relude. We are using the Kowainik style guide. To sum up, here is the Contributing guide we use across the repositories. This project is contributor-friendly, so be kind to other people working on the project. On Linux, to build the summoner-tui you'll need to have libtinfo installed. The easiest way to get this is from your system's package manager and is usually available as the package libtinfo-dev. Summoner uses the golden tests technique for assuring the correctness of the generated files. For this purpose, we have the golden folder with two sample projects to test against. This project was inspired by Aelve/new-hs, which is the tool with the same goal but it's only for creating cabal projects. Icons made by Nikita Golubev from Flaticon is licensed by CC 3.0 BY.